Termite reproductive and other large ants, reproductive are very similar and difficult for the untrained to tell apart. Both are black with two pairs of wings. The three main visible differences are in wings, waist, and antennae. Ants have a larger front pair of wings with a second smaller pair beneath. 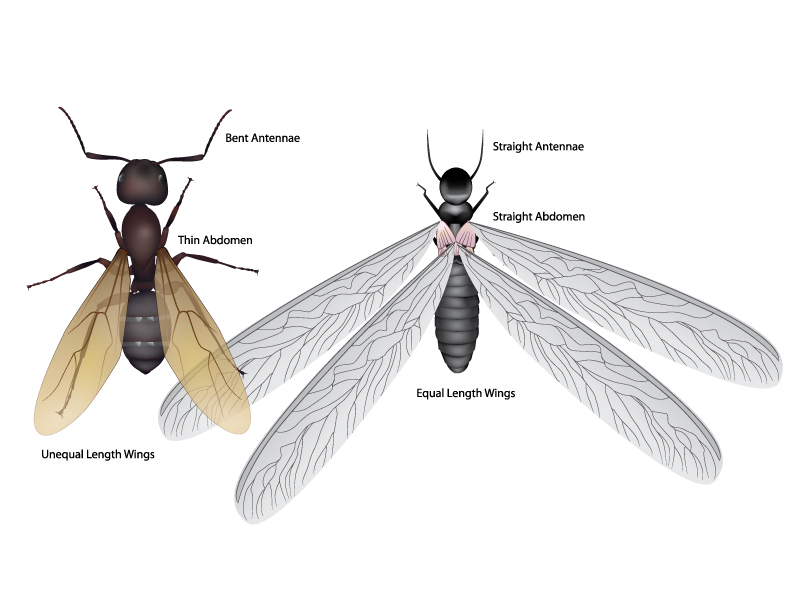 Termites have two pairs of wings that are equal in size and matched in shape and fall off shortly after their flight. Ants have a narrowed “wasp-waist” between their thorax and abdomen. Termites don’t have a waist. Ants have long, elbowed antennae. Termite antennae are straight and beadlike, without an elbow bend.